Audi has unveiled the range-topping RS 3 in Rome. It's a brawny and compact new entry in the RS range, boasting the most powerful 5-cylinder engine in RS history, and no shortage of techy extras. Hot on the heels of the new Audi TT, the Germany manufacturer's newest whip comes packing 362bhp which helps power the car to 62 mph in a rapid 4.3 seconds. It'll go on to reach a top speed of 174 mph, but please note THIS IS NOT STRICTLY LEGAL IN THE UK. Just checking. As ever with Audi, there's also no shortage of tech, with a Bang and Olufsen sound system (15-channel amplifier with a total output of 705 Watts, since you ask), park assist and advanced GPS navigation. Well, there's a satnav. Then there's the multi-mode Drive Select to increase the sportiness or otherwise of your ride, LED lights as standard for the first time, and 4G web access via Audi Connect, which also turns your car into a Wi-Fi hotspot on wheels. For those of you who are more concerned more about the car's green credentials, the Audi A3 Sportback now implements start/stop technology, which manages to return 34.9 mpg and emit 189g/km of CO2. 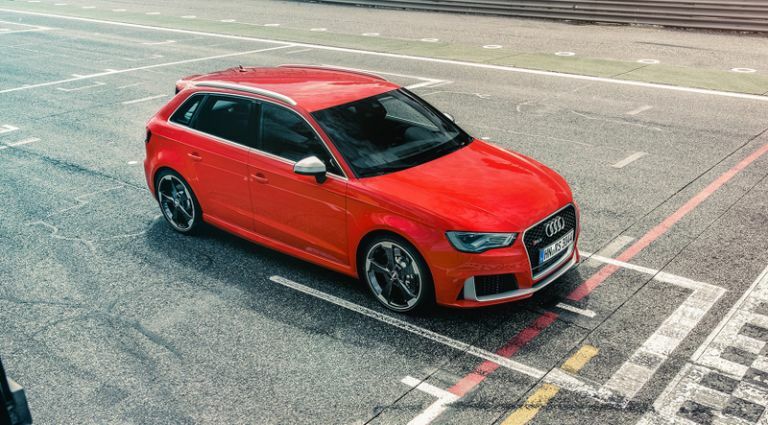 The new RS 3 Sportback is now the topmodel in the A3 range, as such it features sporty interior and exterior details, and, of course, a generous list of standard equipment. The car will roll into dealerships in summer 2015 with prices starting at £39,955.